From the bizarre beach culture of Rio to the urban sprawl of Sao Paulo, here’s a list of things that will shock you about Brazil travel. “What drew you to Brazil?” I asked first off. I’m always interested in knowing what draws people to destinations. The exoticism of Southeast Asia and Morocco appeal to Duke and me, but we have yet to visit South America together. “Cheap airfare,” my friend Ben replied without a moment’s hesitation. He and his boyfriend Derrick subscribe to Scott’s Cheap Flights, a mailing list that informs you of airline deals. It’s well worth paying $30 a year for the premium version. Ben pointed out that within 24 hours of booking, airlines are required by law to refund your money, unless it’s within seven days of the flight. So you call jump on a good price — and back out the next day if you’d like. “We booked three trips almost immediately: Japan, Brazil and Spain,” he said, “And it all cost less than our trip to Australia the year before.” The trip to Brazil ran them only about $400. Neither of them had been to South America before, and “another upside was that it was their summer and our winter,” Derrick said. The fellas stayed about five days in Rio and two and a half in São Paulo. They chose a different neighborhood each day, deciding upon a site or two to see — like the steps where Michael Jackson danced in the controversial “They Don’t Care About Us” music video, directed by Spike Lee, for instance — and then wandered around. Here are their observations about Brazil, a country they found to be more complicated than they ever imagined. 1. 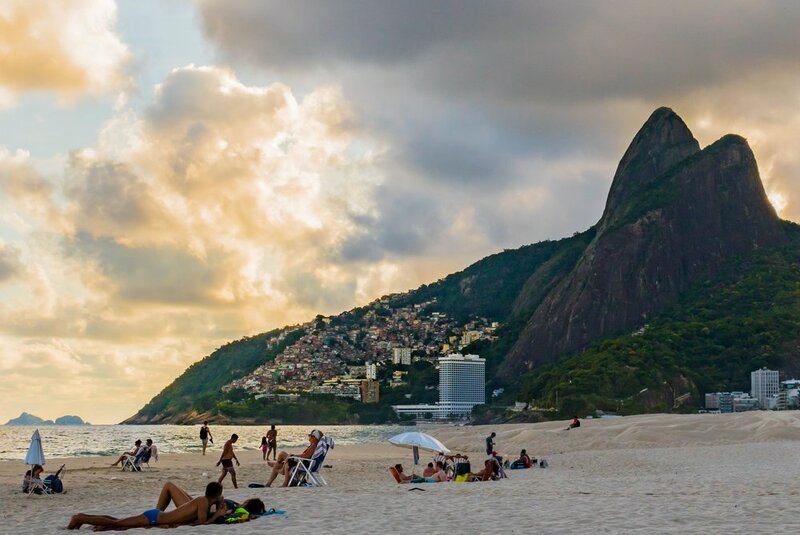 Rio has a huge beach culture — but hardly anyone lays out or goes swimming. People flock to the beaches in Rio, where they engage in athletic activities: volleyball, soccer or paddleball. The beaches are very large, but after you walk about five minutes, you’ve got the gist, because it repeats itself, Derrick said. There’s a pretty black and white tiled path that runs the entire length of the seaside. And all along it, you have different restaurants and vendors, where you can get, say, a 5-pound coconut. The waterfront is divided into different sectors, called postos. Each is known for different things, Ben says: One might be where the models hang out, one’s where the gay guys are, and another’s for families. 2. It’s super cheap to drink in Rio. By the sidewalk are the officially sanctioned snack kiosks, but as you go 100 yards or so onto the sand, you get unofficial tents setups, or guys with insulated backpacks peddling fried cheese, beer and drugs. A lot of people had caipirinha-making kits, and you could buy a drink from them for $3. A bottle of cachaça, a distilled spirit made from fermented sugarcane juice that’s the national drink of Brazil, could be bought at a store for $2. 3. Christ the Redeemer could be lost in the clouds. 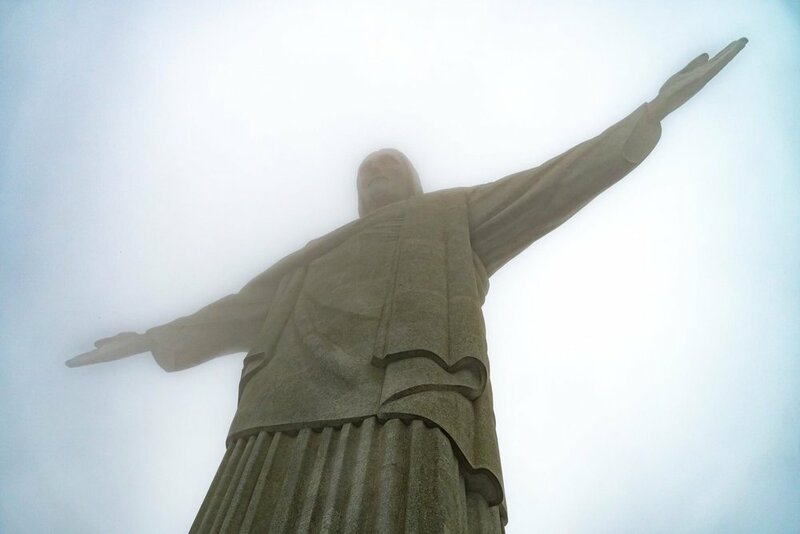 When Ben and Derrick went, the 125-foot-tall statue of Jesus that overlooks Rio atop Mount Corcovado was shrouded in fog the entire time they were there. Be sure you take advantage of a clear day and see the sites that are on the 1,000-foot-high rocky outcroppings above the city. The 125-foot-tall statue stands atop the massive granite dome of Corcovado hill and, since its erection in 1931 has become one of the most famous landmarks in the world. You take an incline railway up Corcovado. “As we were going up, we were like, still nice, still nice — and then, bam! Fog,” Ben says. 4. Brazilians are beautiful — and parade around in next to nothing. They’ll go from the beach to a food stall, wearing a speedo, shoulder shawl and flip-flops. They all wear Havaianas, the super-trendy, colorful plastic flip-flops created by a Scotsman in 1962. 5. But the people aren’t all that friendly. For a city with a reputation as a party city, Ben and Derrick didn’t find the locals to be that outgoing. “I’d always been under the impression that Brazilians were super nice, super willing to engage in conversation, that if they recognize an outsider, they’ll talk to them, but that wasn’t the case,” Ben says. 6. The crime is, unfortunately, as bad as advertised. When they got to their hotel, they were given cards with the hotel’s contact info and were told to leave their wallet and everything else locked in the room’s safe when they left the premises. “Carry this card and a copy of your passport, and that’s it,” Derrick advised. They took what money they felt they needed and kept it in their front pockets. “Don’t take out more than you can afford to lose,” Ben said. “It was a bummer,” he continued, “because I love taking pictures, and my go-to mode is walking around with my camera. Everything I read said, take a photo and then put your camera away immediately in a nondescript bag. “One afternoon we went out, and within five minutes of leaving the hotel, this guy tapped me on the shoulder and told me, ‘You need to put that away. Don’t have it out,’” Ben said. He did feel fine using a cellphone as a camera, though. Just don’t draw too much attention to yourself, he added. Expert tip: Use your work phones — just in case they do get stolen, heh heh. A lot of banks don’t even let you access their interior ATMs after 8 p.m. because of the fear that people will force you to withdraw money, Ben said. Derrick moved the money he planned to spend on the trip from his checking account into a savings account. “There’s definitely a feeling of crime,” Derrick says. Someone told them not to have bags facing the streets because bikers could ride by and swipe them. Both of their Kindles got stolen out of their hotel room — the one thing they didn’t put in the safe. 7. Brazil is an extremely sexual country. Prostitutes are everywhere, especially in São Paulo. “You get propositioned all the time,” Derrick says. There are bathhouses for days, along with love hotels, similar to those found in Japan. 8. Rio didn’t get rid of its favelas (the slums built into the hillsides) for the Olympics. Instead, they’ve had the police go in and take control, Ben said. “It’s like going into a war zone,” he added: police in body armor, SWAT vehicles, guns. They’re trying to drive out the drug dealers and crime lords. Thousands upon thousands of people live in these communities, and they don’t have running water all the time or reliable electricity. “They’re very vibrant communities, but are riddled with crime and corruption,” Ben said. The pieced-together shacks are, ironically, very brightly colored and pretty. 9. Rideshare companies like Lyft are a convenient way to get around. Ben and Derrick have found rideshare apps to be a better option in many parts of the world than taxis — some of which can be corrupt. This way, you’re going through an app, your route is mapped out, and no money exchanges hands. “There’s a lot of honking and screaming,” Ben said. 10. 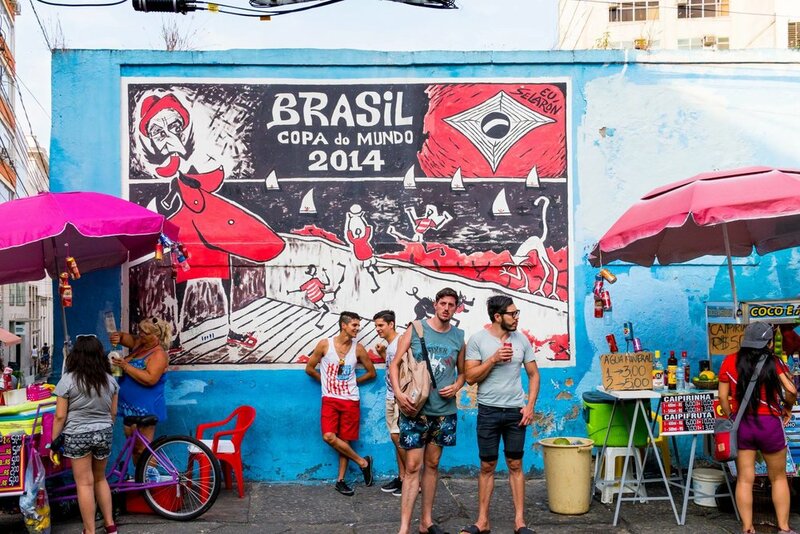 There are some neighborhoods in Rio you can explore during the day — that turn into wild parties at night. 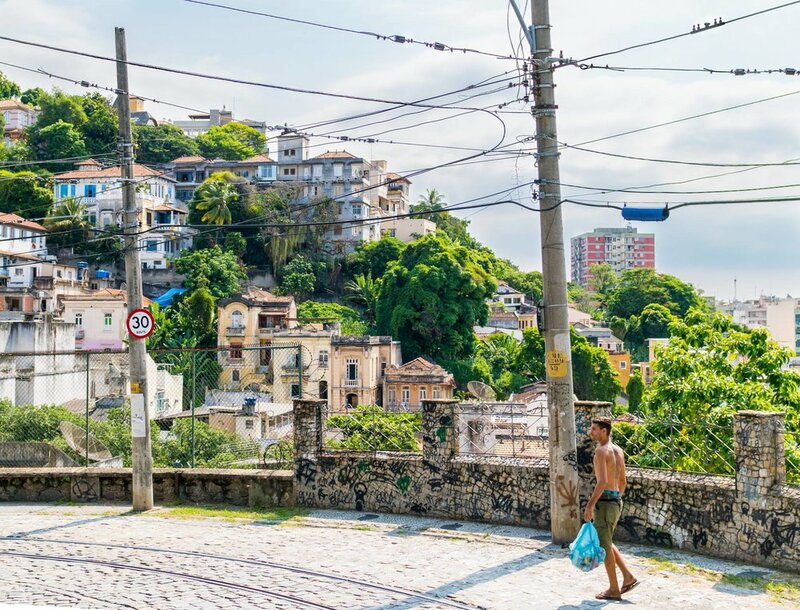 One day, the boys wandered through Lapa — a neighborhood in central Rio that’s easily identifiable by the aqueduct. Then they took the historic tram up the hill to Santa Teresa, a charming artists’ community. There’s an old mansion that burned down that’s now an art event space. They also checked out Lapa at night, and saw about 300 people hanging out in the Shell gas station parking lot. This is known as the bohemian and samba district. “People are dancing right in the streets. It’s mayhem,” Ben said. Lapa is directly downhill from a favela, and there’s a lot of pickpocketing on weekends. A local girl told them that she survived Carnaval without getting anything stolen cuz she had a fanny pack that she wore under her clothes. “While I’m sure that tourists are more targeted, it also happens to Brazilians,” Ben said. 11. You’ll see monkeys running around everywhere in Rio. They’re marmosets and they’re cute and like to scamper over power lines. From Ben and Derrick’s experience, they’re didn’t seem dangerous. 12. There’s not a lot to do in São Paulo. 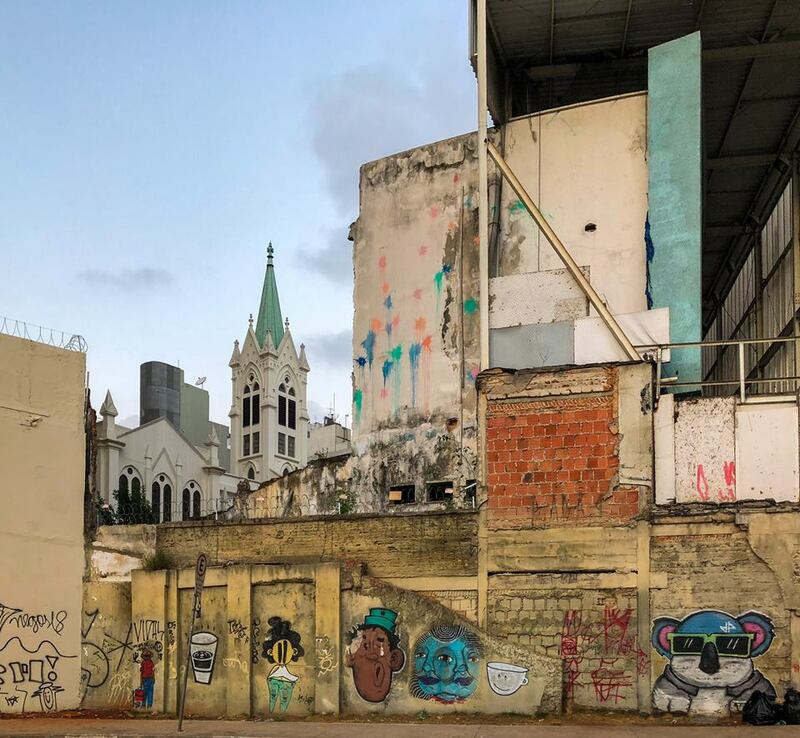 Despite being the most populous and geographically largest city in all of South America, São Paulo doesn’t offer much for the tourist, according to Ben and Derrick. “Unless you want to eat really good food and drink really well, there’s not a lot to do during the day,” Ben explained. Of course, they did find a couple of cool museums to explore: MASP (Museu de Arte de São Paulo Assis Chateaubriand) and Pinacoteca do Estado de São Paulo. 13. São Paulo is like the gritty parts of New York — but without the visual appeal. It’s one rundown, dirty storefront after another, Ben said. Mile after mile of urban sprawl. They would be walking around and feel safe, and then turn onto a street that felt super sketchy. It was block-by-block. 14. There’s a shoe shine scam to watch out for. In a scam that’s even used here in Chicago, a man will approach you, squat down and smear something all over your shoes. “It looked like a brown sugar mixture,” Ben said. Then the man will make a big deal about the mess will start to clean it up — wanting, of course, to be paid about $30 for his trouble. When this happened to the fellas and they declined, the man stood there, cursing them out. 15. The cuisine consists of lots of meat and lots of beans. Beef, cow, goat and seafood are omnipresent. Vegetables? Not so much. You might want to try a dish Brazil is famous for: feijoada, a stew loaded with different types of slowly braised meat that takes five days to make. 16. Distances can be deceptive in São Paulo. You can look at a map and think, That’s not too far away — and it’ll end up being an hour Lyft ride, Derrick explained. Ben’s friend told him that it takes about three hours to drive from one end of the city to the other. 17. Overall, Brazil is a difficult country to navigate. Ben and Derrick have traveled all over the world — and they found Brazil to be one of the more confusing countries. “If you don’t know somebody, if you’re not part of a tour group, if you don’t travel a lot, or if you’re not street smart, it definitely requires a higher level of awareness,” according to Ben. “In a lot of ways, our trip to Brazil was unremarkable. Brazil is really about being in the moment, taking advantage of what’s there,” Ben said.